Summer runs from early June through mid-September, when temperatures stay pleasantly warm. Daytime temperatures are typically in the 70s (or 20s Celsius) with high humidity, especially in July and August. Temperatures below 60 are rare but not unheard of. Although the days are usually warm and sunny, the nights can be cool in the summer. There is always a possibility of rainstorms or, more likely, summer showers. In fact, the city sees the most rainfall between June and September, with an average of 4.5 to 5 inches of precipitation each month. Clothing made from breathable fabrics works best for humid days, and at night, a light jacket and long pants are recommended for dinner or an evening stroll. 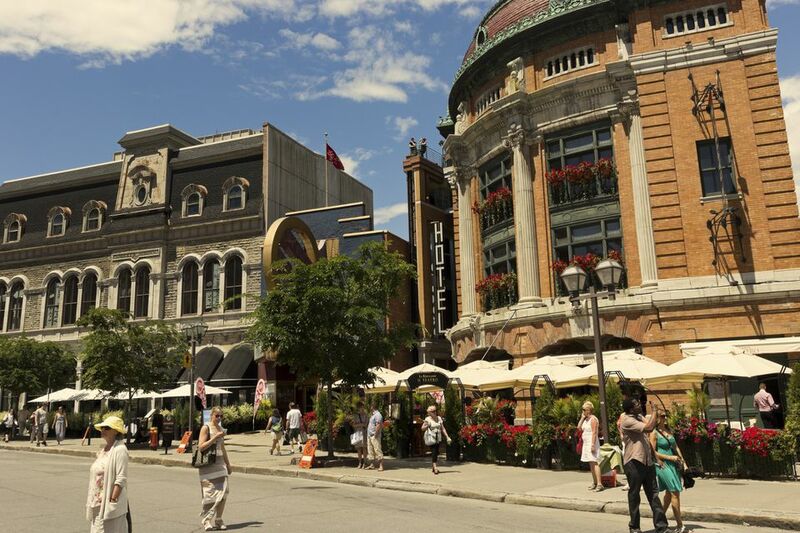 Most importantly, pack comfortable sandals and walking shoes because the streets of Quebec City are steep and cobblestoned. Other summer must-have items include a water bottle, sunglasses, hat, and sunscreen. Street style in Quebec City is best described as fashionable yet understated. While more casual than Montreal, the emphasis for both men and women is on clothing of good quality and cut, especially for evening and business wear. This means that ladies should ditch the short-shorts for a cute and comfortable summer dress while men should leave the cargo shorts at home and wear a nice pair of jeans or dress shorts instead. Business casual dress is more acceptable in Québec City than in Montreal. Sundresses, skirts, dress shorts, and lightweight pants are more comfortable than jeans in the summer. Baseball hats and track pants are not such a sin here as in Montreal, possibly because of a higher density of tourists, especially in summer. But even still, you may want to dress sharply to blend in with the local style. There are many exciting things to do in Québec City in the summer, however most of them revolve around the festivals and outdoor concerts. The Québec City Summer Festival: This 11-day music festival in July is one of the most notable summer shows. New France Festival: This festival brings parties, parades, and performers every August and draws massive crowds. For fewer crowds, cooler weather, and lower fares consider visiting during the Indian summer (mid-September to early-October). Budget travelers should splurge on air-conditioned rooms during July and August, but keep in mind that some rooms may have noisy window units, so bring earplugs for a better night's sleep. Earplugs will also drown out the noise from festivals that are common in the summer months and can run into the late hours of the night. Because of the warm weather and many public events, it's wise to book your hotel rooms at least a month or two in advance.